For dry rub, combine oregano, coriander, thyme, cumin, curry powder and salt in small bowl. Moisten pork tenderloin with water; coat with dry rub. If desired, place pork in shallow dish; cover and marinate in refrigerator for 8 hours or overnight. Heat oven to 450 degrees F. Place pork on rack in shallow roasting pan. Roast until an instant-read thermometer inserted into center of pork reads 160 degrees F., 25 to 30 minutes. Slice pork; arrange slices on a serving plate. 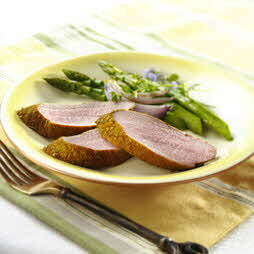 Lean and healthly tenderloin roasted with a simple rub. Serve with Ginger-Orange Carrots and Grapes andHerbed Couscous and Vegetables.